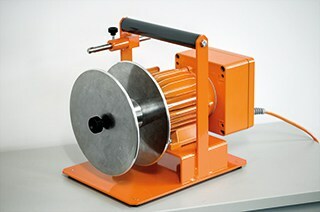 The WINDER PR 2000 was designed to take up and wind up single or multiple yarn ends. It is used on warp knitting machines , weaving machines and others. The necessary motor torque can be adjusted precisely according to the number and size of the yarn ends. 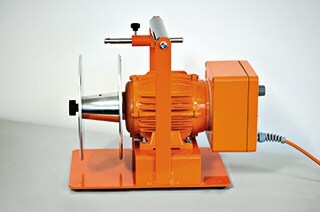 The take-up speed will set itself to the let-off speed of the yarn using the pre-set torque force. The maximum revolution speed is restricted to 240 rpm. If this revolution speed is exceeded, the motor will be switched off. 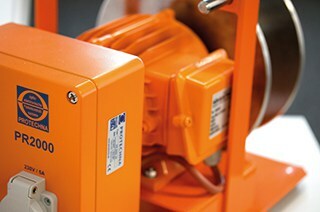 Upon reducing the speed, the set torque force at the motor will be switched on again. The yarn can be removed from the take-up by unscrewing the front flange and taking the yarn off the cone. The winder must not be turned off when the production machine is temporarily stopped for repairing a defect etc. Only if the machine is stopped for a longer period of time, for instance overnight, the WINDER should be switched off. An indicator lamp shows whether the device is switched on or off.